Staff of Educational Recreational Adventures has just completed our 4th week of Outdoor Adventure Camp with campers from 7-12 years old. 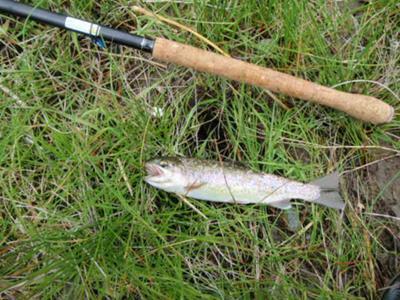 One day was dedicated to fly fishing but three days offered some opportunities to fish. Over the course of the week, the 10 children caught at least 22 cutthroat or rainbow trout, mostly skittering elk hair caddis and swinging soft hackles. Adults do nothing but underestimate what children can do. With a little patience and some assistance in hooking the first fish, very young kids can be successful fishing tenkara gear. It is also much more convenient for the guide. I simply hiked the trail with 8 tenkara rods, each with flies attached and in their respective sheaths hanging from my neck and handed them out as we came upon good-looking places to fish. 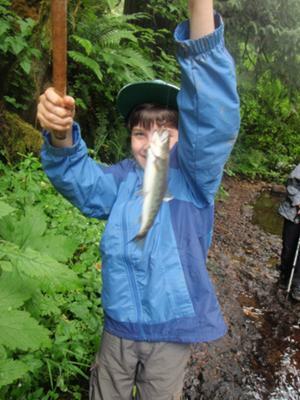 ERA is conducting a Fly Fishing and Freshwater Ecology Camp (http://www.opalcreek.org/programs/summer-programs/OpalCreekExpeditions.aspx) for anglers 10-15 on August 14-19 at Opal Creek Ancient Forest Center, located in a forest with trees over 1000 years old featuring abundant native rainbows in crystal clear water. An adult version of the camp will take place on August 26-28. Both camps will feature a variety of tenkara gear as well as traditional western gear. You're doing great work introducing children to the joy of fishing through the simplicity of tenkara. From time to time, people ask me for rod recommendations for kids. I guess I'm one of those adults who underestimate kids, because I've generally suggested the 11' Iwana, thinking that the extemely light weight and shorter length would make it easier for them to wield. However, in your last photo, that is clearly an Amago, which I never would have thought to recommend. Do you find that the younger kids can handle any of the rods? Do they use the longer ones two handed? I suspect there are a lot of parents in other parts of the country who would not be able to send their kids to your camp but who would be very interested in your methods. 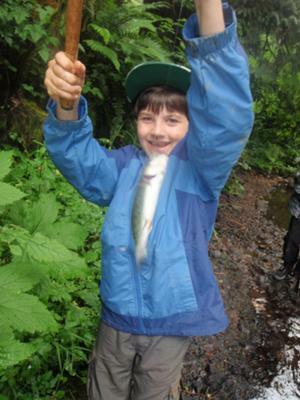 Educational Recreational Adventures travels to communities out of state to conduct fly fishing programs for kids, kids and parents, adults, fly fishing clubs, etc. 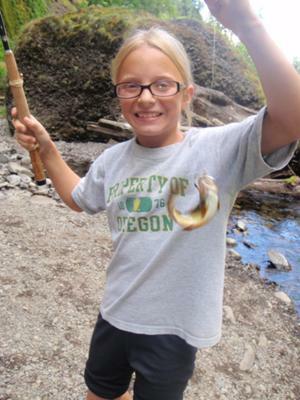 The Ayu is the most popular/rod of choice for kids. The little ones, ages 5-8 yrs old cast two-handed.